Three comets are approaching right now that could be good or even really good: Elenin in 2011, Garradd in 2012 and PANSTARRS in 2013. Here are general visibility conditions calculated for Bonn (51°N), La Palma (28°N) and Jo'burg (26°S), with the brightness based on current visual observations (available only for Elenin and Garradd) and further behavior as assumed by the JPL's HORIZONS on-line solar system data and ephemeris computation service which is also used for the topocentric situation. In a nutshell: Elenin this October will never be easy and/or impressive but fine for specialists, Garradd coming February will be very easy but only at +6 mag. - and PANSTARRS (the orbit is still improving every few days) should cross the zero magnitude boundary but will be close to the horizon whereever you are. October 10-15: at 30-45° when twilight starts, 5.0 mag., bright Moon interferes! October 21: already at 30° when waning crescent rises, 5.5 mag. October 25-30 (pretty good): transits at 69° just before twilight begins, Moon gone, 6.0-6.5 mag. 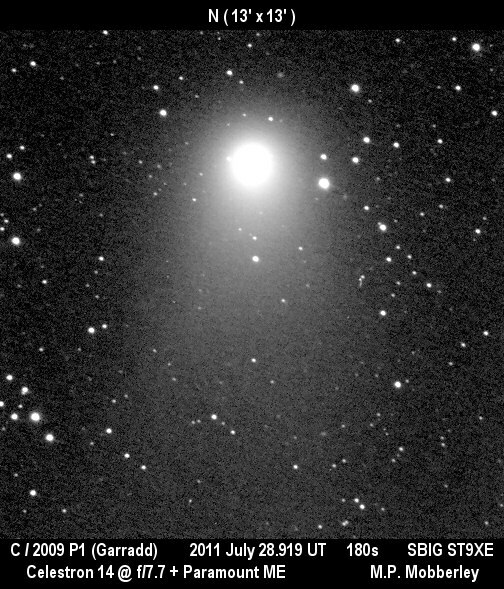 October 25 (pretty good): comet near zenith, no Moon, 6.0 mag. October 10: morning reappearance at 10° with 5.0 mag. October 25-30: transits without Moon at 30° with 6.0-6.5 mag. March 13: at 6° in bright twilight, with -0.3 mag. March 16: at 6° in deep evening twilight, with +0.3 mag. March 6, 2013: 3° in bright dusk, but at -0.3 mag. March 8: 3° in bright dusk, at -0.5 mag. March 15: 6° in dusk, at 0 mag. March 20: 7° in dusk, at +1.5 mag. Speaking of comets, there is another Elenin now (more), pictures of 45P/Honda-Mrkos-Pajdusakova of July 27 (more) and July 26, a visual report and pictures of Garradd of July 30, July 29 (more, more and more), July 28, July 26 and July 25 (more), SOHO observations of fading Hartley 2 - and a paper and CBET on a new meteor shower that may indicate an unknown comet threat. • Stories about a meteorite fall in Kenya, a fireball in Texas and a big meteorite (more, more) in China. 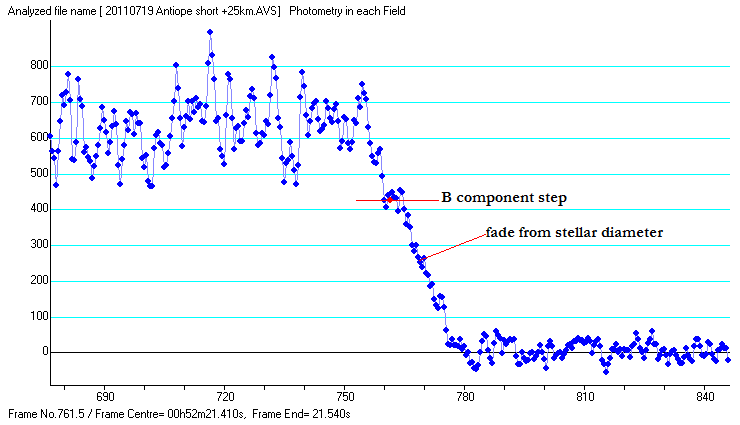 Turning to asteroids the campaign to observe a star occultation by double asteroid (90) Antiope in the US was a major success, as these chords demonstrate; more reports here and here, plus a lightcurve. • The first Trojan of the Earth has been found: a paper, animations, an extrapolation, press releases here, here, here and here and stories here, here, here, here, here, here, here, here, here, here, here, here, here, hier, hier and hier. An alleged Uranus Trojan (which would also be a first) is pretty dubious, though (more). • A fourth satellite of Pluto has been found in HST images - and its correct name is S/2011 (134340) 1 and not "P4": a CBET, press releases here, here and here and stories here, here, here, here, here, here, here, here, here, here, here, here, here and hier. (Before someone asks: Having one or more satellites has nothing whatsoever to do with an object being a planet, dwarf planet or minor planet - just look at the long table of minor planet moons already found!) Also more on the star occultation by Pluto and Haumea's ice. The Moon & Mars from Oz on July 28. And the successful demonstration of the elliptical orbit of the Moon! In other news on the Sun there are 3 nice groups right now (with an M9 flare on July 30), and there was a cool eruption, while science-wise TSI measurements are problematic, the GIOVE satellites watch for radiation and Alfvén waves are again blamed for coronal heating effects: press releases here and here and stories here, here, here, hier, hier, hier und hier. Plus aurora observations during STS-135. 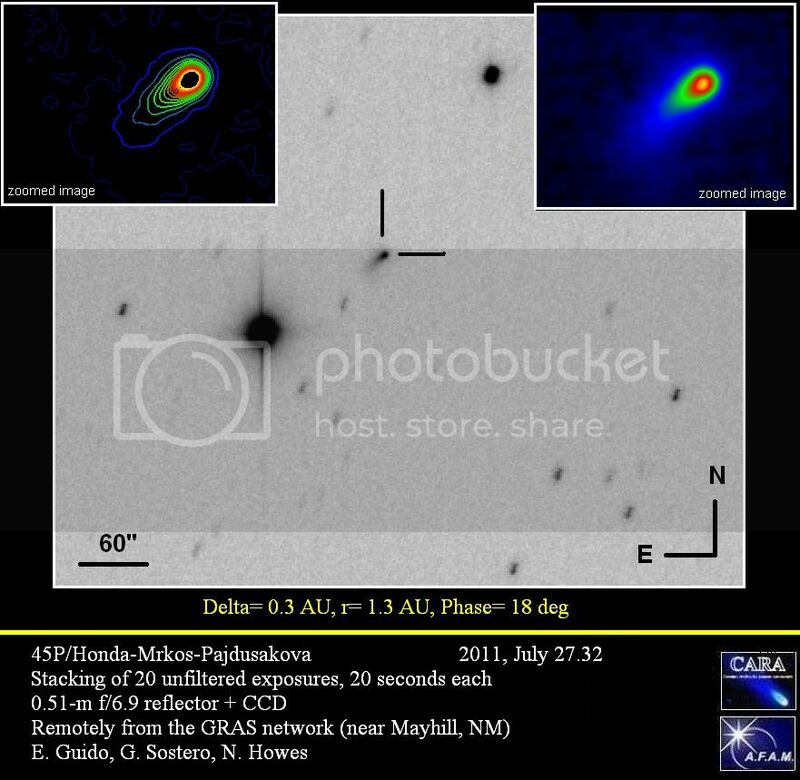 • Amateurs found yet another planetary nebula (more, more - and a weird story ...). • More NLCs from Germany on July 26, the UK on July 23, the UK and Finland on July 22 and the UK on July 18. • The fiery return of STS-135, Atlantis' final Sun transit (more), many ISS pics in front of the Sun, the ISS in daylight, the ISS & Atlantis over Oz (more, more) and the docked pair crossing the Sun. • Highlights of August 2011 include a - not that - close approach by (3103) Eger on Aug. 4, the Opposition of (4) Vesta on Aug. 5 (with Ceres in the vicinity, too), the Moon-swamped Perseids on Aug. 13, a close approach of comet 45P on Aug. 15, Neptune's opposition on Aug. 23 and the conjunction of (15) Eunomia and 42 Per on Aug. 25. Pretty good star occultation by asteroid for the U.S. - and to be webcast! A rare eclipse of a star visible - in principle - in binoculars by a double asteroid, (90) Antiope, will be visible in Western parts of the U.S. and central Canada in the night 18/19 July: The eclipse of the star LQ Aquarii will last up to 30 seconds in a 125-mile-wide path from the San Francisco Bay area to Boise and W. Montana, then crossing the border (and into bright dawn), and a few who happen to be in the right place might see two eclipses, one by each component of the Antiope pair. Anyone in the path can help accurately measure the size and shape of the objects by making simple observations of the eclipse , though, and the International Occultation Timing Association (IOTA) seeks as many observations of the eclipse as possible. The Moon will be nearby and bright, making the 6.7-mag. star hard to see with small optics - but if you aren't there, don't have clear skies or suitable optics, don't worry: The event will be webcast plus recorded with a lot of cameras! In other solar system stories meteorites & the law, the NEO 2002 NY40 - many saw rushing thru the sky - as a bolide source, and bolide stories from New Zealand and Brazil. 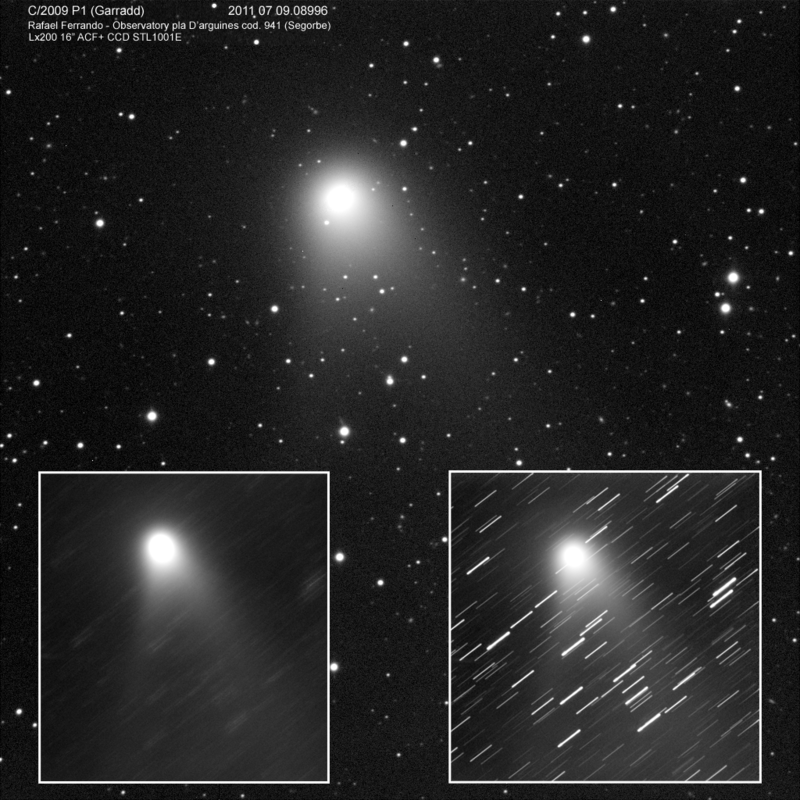 • While comet Garradd is not in outburst, it's still worth observing, as pictures of July 10, July 9, July 8 and July 7 - by M. Jäger - show. 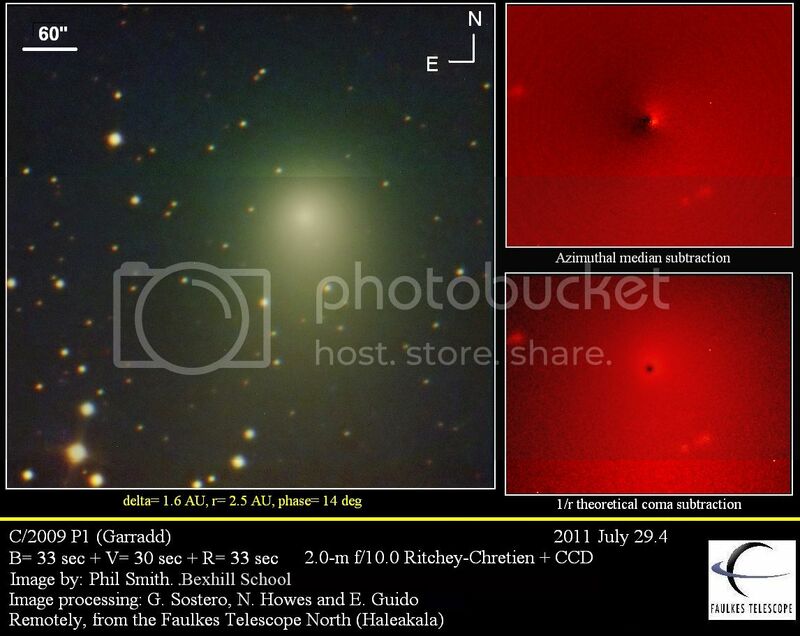 • News comets C/2011 N1 and N2, the big sungrazer was also seen in front of the Sun (enhanced), but why is unclear - and Hartley 2 had a dust trail! • The June lunar eclipse in a wide-angle time-lapse movie from Tajikistan and pictures from Namibia, Israel and Italy; also the umbra study gets mentioned. • One fish-eye picture with a lot of planets on July 9 - and Jupiter close-ups of July 16 (another one) and July 11. 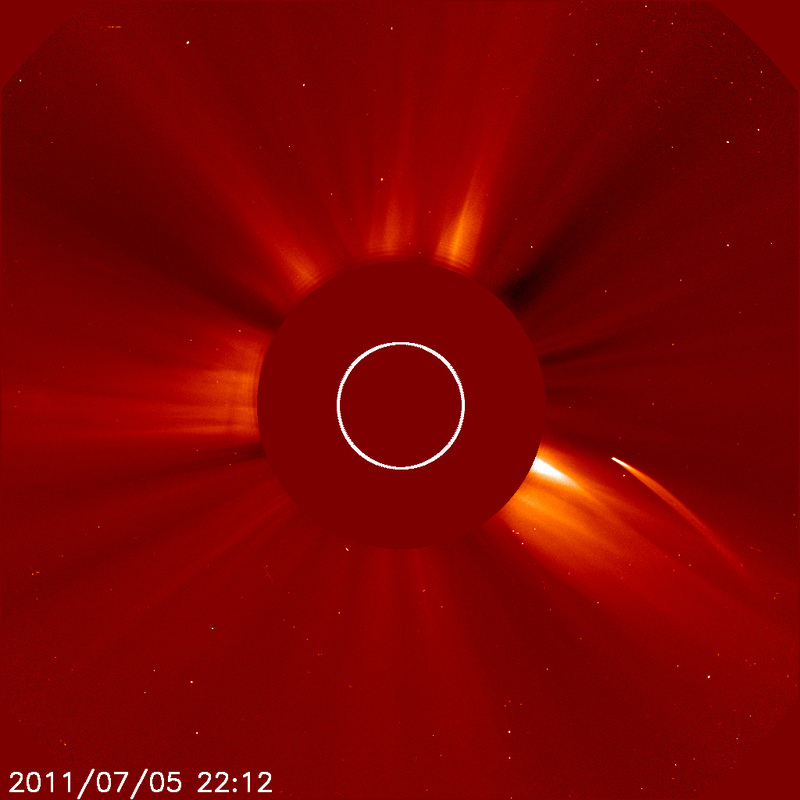 From the Sun thoughts about flares on 7 June 2011 and 14 July 2000 (still a science topic! ), also new ways to measure magnetism around the Sun. 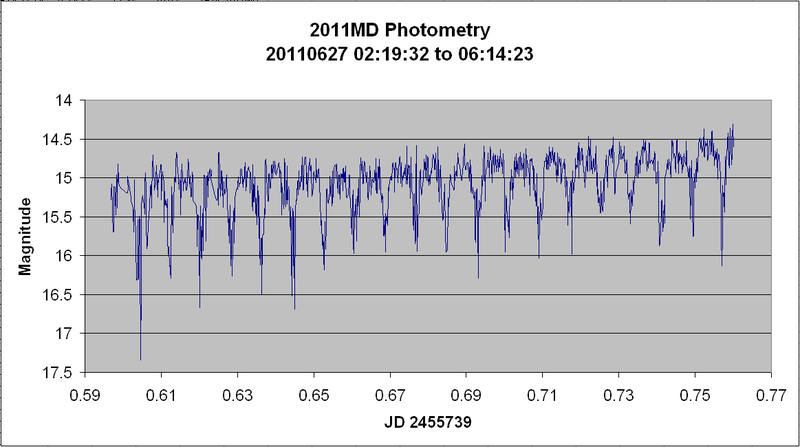 • The light curve of SN 2011 dh in M 51 so far (and pictures of July 12 and July 9), the unusual brightness of Del Sco and the light curve of Eps Aur. • More nice NLC displays over the U.K. on July 14, Germany and the U.K. (more, more, more, more, more, more, more and more) and elsewhere on July 10, from the U.K. on July 7/8 (and stream: more, more and more), from Sweden on July 5 and Ireland on July 2. • A meteor camera recorded sprites. • And for the last time the ISS w/shuttle in front of the Sun (more), also a windy video and report about another transit, a glory seen from a camera on the launching shuttle - and a report on amateur astronomers imaging the launch. Early July marks the middle of the 'official' northern NLC season from mid-May to mid-August - and this year these weird clouds at 80 to 85 km delivered, although mainly for latitudes around 55°N, with the most spectacular reports and pictures coming from Cumbria (northern England) and Scotland, esp. on the morning of July 3. A so-so display over Germany in the night July 5/6 (also sightings in the U.S.). The great U.K. outburst on the morning of July 3 reported in all detail from Cumbria and also by another Cumbrian (picture stream, also here and here, with more here, here, here, here and here; got even in one paper) and a Scot (another, another and another) and another and another Brit, plus more, more and more pictures. From July 2 a cellphone and more U.S. images, a moderate U.K. morning show (more, more, another observer, more) and German sightings. From July 1 another U.K. report and Scottish pictures plus German sightings, also on June 29. Plus a Dutch report and a growing gallery. Solar system small bodies: an updated lightcurve and animation of it, another big page and trailed images of NEA 2011 MD - which came so close that Earth's oblateness had orbital effects! • A recording of a webcast of a star occultation by an asteroid, foiled by one cloud ... • A German lunar impact observation is now official (and sets a record for the smallest telescope, 10 cm). • New French meteor predictions out. 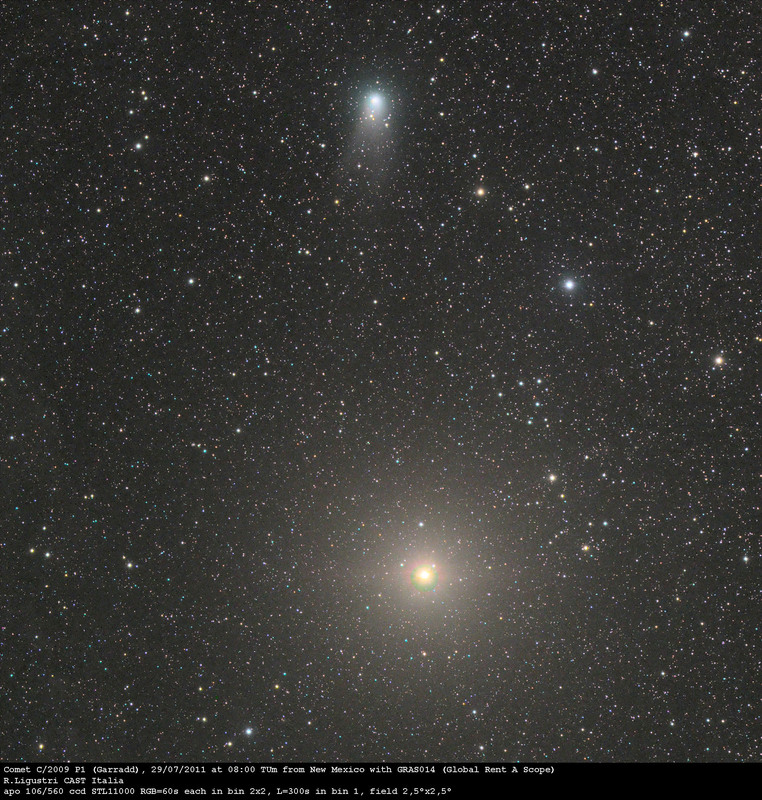 • A bright sungrazer hit the Sun last night (hi-res still; more) • Pictures of July 5 and July 2 (another one) and the lightcurve (from this site) of promising comet C/2009 P1 (Garradd). Moon vs. Sun: the setting crescent on July 4 (still), Mercury & the Moon and the Moon setting on July 2, the very young Moon from Oz on July 2, two partial eclipses as seen by Proba 2 - which won a price with this - on July 1 and Venus & the Moon on June 30. • Also a slideshow of the lunar eclipse on June 15 from India and a summary plus cloudy Iceland pictures (trip report) of the solar eclipse on June 1. • Epsilon Aurigae is completely "back" now. • A nice ISS Sun transit of May 10. • And a report, another and another from the ALCON event at Bryce Canyon. Only the ESA satellite Proba 2 could observe it as the zone of visibility off Antarctica was as remote as it gets - but the tiny partial eclipse of the Sun early today was special: It marked the beginning of a new solar eclipse cycle, with the number 156; the last one with number 155 had been "born" on 17 June 1928. "We will not have to wait as long for the next new solar eclipse saros cycle to start," explains Jordan Sutton on the Solar Eclipse Mailing List: "just under 47 years until saros 157 is born on June 21, 2058. Saros 156 contains 69 eclipses, starting with eight partial eclipses, [...] followed by 52 annular eclipses, and concluding with nine partial eclipses." No total eclipses are included but that's not unusual. • After months of secret preparations it's now official: The 4th Solar Eclipse Conference will take place in India in December; Details are still sketchy, though. • There is already a paper on the umbra on the June 15 lunar eclipse (two more reports from Turkey and Austria). • On June 30 the Moon occulted Venus in places like Jordan, or there was a close appulse as on La Palma (more, more) or a wider conjunction as in the U.K. (more, more); the day before the Moon was near Mars. Sky highlights in July (see here, here, here and here) consist mainly of a mediocre evening visibility of Mercury which has already begun, the coincidence of peri- and apogee of the Moon with 1st and last quarter and the occultation of a faint star by asteroid (52) Europa which can be observed in the U.S. • Some more reports also on the stellar occultations by Pluto (more, more). • Two more small moons of Jupiter were announced recently. • The best visuals of the close visit of NEO 2011 MD were shown and linked to here already; more images from June 28 (and earlier), early June 27 (more, more, more), late June 26 (more, more) and late June 25 (more), some news coverage here, here, here, here, here and here (another contender for the worst headline; "asteroid grazes atmosphere" ...) and informative previews here, here and here. • There is a new object on a comet-like orbit, but 2011 MM4 shows no activity, in contrast to C/2011 M1 (LINEAR). • More previews for Elenin and PANSTARRS (more). 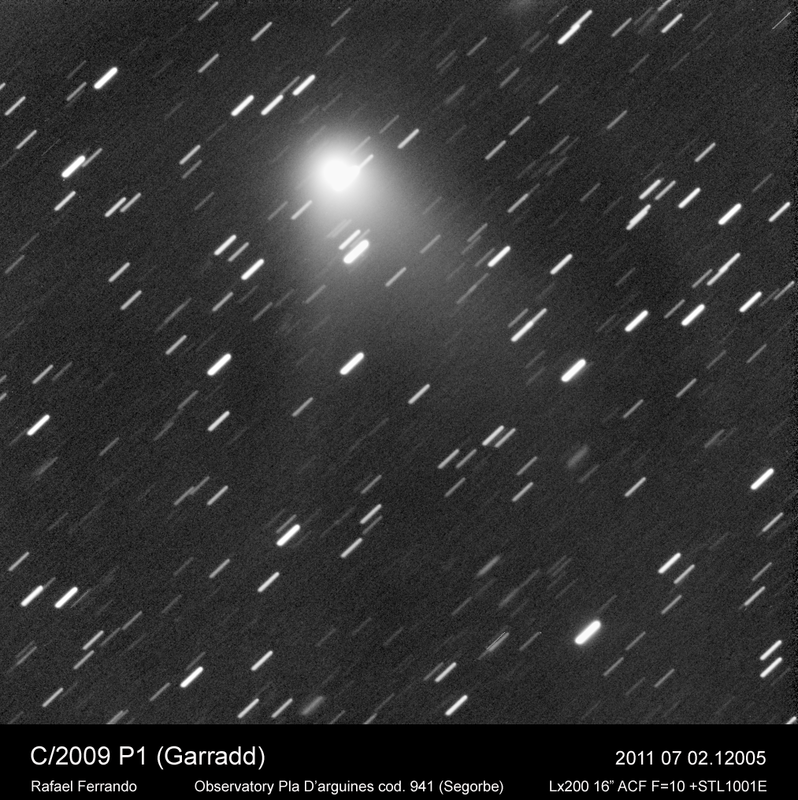 • Comet Garradd on June 29 and June 26 (more). • Further criticism of claims that solar activity is about to cease. • A growing gallery of NLC pictures; there was a great show in the U.K. this morning (in motion), also observed from another location (more, more, more); earlier reports from the U.K. on June 29, Canada on June 28 and Poland on June 26 and June 19. • Finally a fine green segment on the Sun - and a weird sky bubble seen from Hawaii on March 22 (another video): obviously linked to a rocket test, but the physics of the bubble remain mysterious.